New Delhi, 19 July 2018: Cornitos, the flagship brand of Greendot Health Foods Pvt Ltd introduces “Party Mix” as a part of its exotic Pop N Crunch range of Nuts and Seeds. Cornitos Party Mix is a perfect snack to be enjoyed with friends and family during celebrations available in 200g and 28g packs. The Flavor is tempting and refreshes the taste buds with exotic taste. 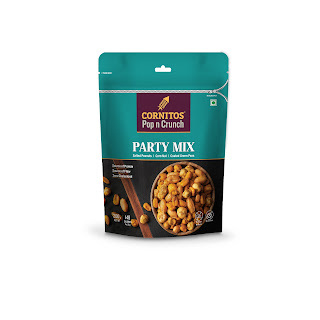 Cornitos Party mix is an assortment of hot & spicy & wasabi green peas, salted peanuts and corn nut that can kick start any party. Wasabi green peas, salted peanuts and corn nut are a great source of protein, fiber containing nutrients and essential minerals. Party Mix is cholesterol free snack ideal for house party, travel time munching, snacking in office and even post-workout snacking. 200g Resealable Pack of Party Mix has a functional design giving consumers advantage of multiple time product use instead of one-time snacking. Small 28g Pack of Party Mix is on the go snack priced at economical price of Rs 20. Cornitos is the largest brand in the Nacho Crisps category in India. Cornitos Brand Portfolio includes Nacho Crisps, Taco Shells, Chunky Salsa Dips, Roasted Premium Nuts - Cashews & Almonds, Coated Green Peas and Pickles - Jalapeno Peppers & Gherkins. Cornitos has an extensive distribution network across Pan India. Complete Range of Products available in Retail, E-Retail and Modern Trade stores. Institutional sales across through Airlines, Horeca, Multiplexes and Cafes. Cornitos products are exported globally, to the USA, Australia, China, Singapore, UAE and South East Asia. Greendot Health Foods Pvt Ltd was the first company to launch Nacho Crisps in Indian snacks. The production facility at Roorkee, Haridwar district, Uttarakhand, is equipped with state-of-the-art processing machinery and is manned by a team committed to quality. GHFL is ISO-22000, HACCP and Halal certified company. It also has registrations from FSSAI and US FDA.